Do it yourself. It's a wonderful idea and beat personalized gift for your firends, family or members. Because there are memories that we may want to keep, to store, to share with family mumbers, friends, rocords that in photo albums, decor it with hands, which would become a special collection. 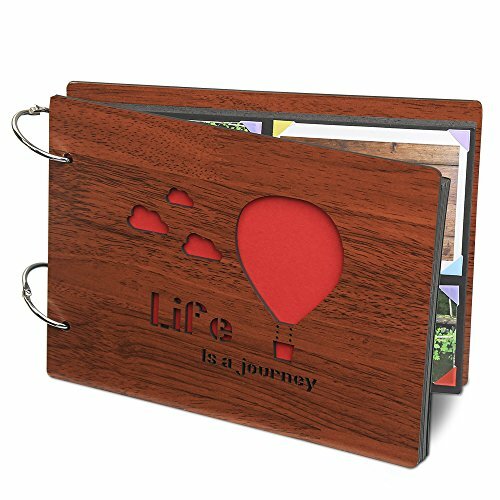 To creative memories with DIY photo albums, pick the happinest, most joyful,unforgetable moments which recorded on prints, decor it with scrapbooking supplies we carefully selected, come with our innermost thoughts and feelings, let it be a wonderful and precious gift! The gift can be used for anniversary, personalized, valentine's day, father's day, birthday, christmas day, baby shower, mother's day. Durable: the wood is very sturdy and the black card pages inside are thick. Do it yourself：This will be the perfect DIY personalized gifts. You could add more pages with right cardstock and punching hloes in them, then opening the binding rings to put them in. Great gift for: It can as baby photo album,wedding photo album,anniversary,,valentine's day, mother's day, father's day, baby shower, birthday, wedding guest book, Christmas day, daily photo storage, travel record. The cover size: 8*6 inch, inside page size: 7.9*5.9 inch, it comes with 2 binding rings. You could post the pictures with the triangle stickys or corner stickers. *6 inch, inside page size: 7.9*5.9 inch, it comes with 2 binding rings. You could post the pictures with the triangle stickys or corner stickers.